All of our instructors are certified in Pilates and/or Barre, and have had additional training in pre/ post-natal exercise, and exercise modifications for injuries and special health conditions. Our instructors regularly meet for additional in-house training on topics like new exercise research, specific injury guidelines and new exercise choreography. CARYN CONNARTON is the owner of Beyond Fitness Pilates & Barre Studio. Her classes are definitely some of the more challenging classes on the schedule, but she'll make sure you also fix your achy spots while you are sweating it out. She is definitely the person you want your initial private session with if you have an injury or health concern. It's also worth taking one of her rolling classes at least once so you know how to use all the amazing massage tools here before or after your other classes. Caryn currently offers pilates and barre-based physical therapy, private pilates sessions, weekly group pilates and barre classes, sport-specific athletic conditioning classes, Anatomy Workshops using Anatomy in Clay and Instructor training and mentoring. YISHUAN CHIN is a long time Beyond Fitness Pilates devotee turned instructor! She had been taking Pilates Reformer, Pilates Mat and Barre classes here for over 10 years before she decided to become an instructor. Yishiuan fits right in with our academic population, not just because her other job has her working at Harvard and Leslie Universities, but because she teaches a cerebral, calculated class, with lots of attention on correcting form. Her classes are welcoming to all levels. Yishiuan has taken our own Anatomy in Clay workshop and our Intensive Barre Teacher Training, as well as the STOTT PILATES complete instructor training program, including the pilates mat, reformer, Cadillac, chair and barrels. Since joining the Beyond Fitness Pilates Studio team she has taken additional workshops in Injuries and Special Populations, Pre and Post-natal Pilates & Barre, BOSU & Barrel, and Tower Programming. KATHLEEN CURRAN CHENG joined our team in 2008 and now teaches just a few morning privates here. She is a STOTT certified Pilates instructor, Yoga instructor and Certified Holistic Health Coach. She holds a Master’s Degree in Cardiovascular Health and Exercise from Northeastern University and a BFA in Dance from the Boston Conservatory. Kathleen attended the Institute for Integrated Nutrition. She enjoys sharing her knowledge to improve health and wellness. Kathleen strongly believes that practicing Pilates can bring positive changes to her client’s bodies including strengthened abdominal and back muscles, improved alignment, increased flexibility and heightened body awareness. ALI EVANS is a Beyond Fitness Pilates Studio class enthusiast turned Barre instructor! She originally came to the studio to find a safe way to exercise without aggravating her scoliosis and fell in love with the classes here. 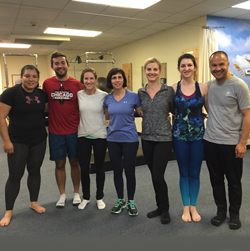 When Caryn noticed how encouraging she was to her fellow students, she invited her to take Beyond Fitness Pilates Studio's own one-on-one intensive barre training program, including the Intensive Anatomy in Clay, Pilates & Barre for Injuries, & the Pilates Arc Barrel and BOSU training. She went on the get certified in STOTT PILATES. She has also completed workshops in pre and post-natal exercise, injury modifications, and exercise for building bone density. Ali is a part time pilates instructor and part time rock star (literally! ), so naturally she has THE best playlists. Her classes are lots of fun and welcoming to those of all levels. ROSE GIOVENETTI is a part time STOTT certified pilates instructor, part-time tap dancing instructor, performer and comedienne! She is our senior exercise specialist, teaching Pilatoga to the music of Ella Fitzgerald and Duke Ellington and Pilates with Props to a cool playlist only a musician could put together. Rose loves keeping all ages moving, her current client list includes a 16 year old junior olympic champion and a personal training client 106 years young! Rose's classes will keep you laughing while you safely strengthen your muscles, and improve your balance and posture. Rose credits her personal pilates practice for being able to walk the Camino Santiago across Spain 3 times in the last few years, and to continue performing (most recently in Belgium)! You might recognize her because since 1979, she has taught group exercise classes all the best studios in the Cambridge area and she teaches tap dancing at Deborah Mason's Performing Arts Center. Rose joined our team in 2007, and has taken our in-house instructor trainings including our Intensive Anatomy in Clay course. We have all learned something from Rose's extensive experiential knowledge as a dance/ movement educator. MJ KENNY teaches private and group pilates classes here that will keep you laughing as she keeps you moving! MJ teaches with a dance instructors eye for for detail on keeping proper form. She discovered Pilates as the capstone to a personal post-surgery rehabilitation, and loves teaching others how to use pilates to achieve their goals. MJ joined our team in 2006 and regularly helps athletes, dancers, and those with injuries alike achieve amazing results. MJ's original training was in a classic pilates studio, and has participated in all our instructor workshops including Pilates and Barre for people with Injuries, exercise to improve balance and bone density, TRX and Tower programming. Her classes are lots of fun and welcoming to all levels. When she's not teaching, you'll find her biking around Cambridge or out sailing on the Charles. MONICA KIMBALL (formerlly Connarton) teaches arguably the most challenging Barre class on our schedule! You'll push yourself to plank and pile to a motivating playlist. Come prepared to sweat! Monica passion of for Pilates began when she was looking for ways to stay injury free during marathon season. Monica has been certified for Barre by Balanced Body University & our own Beyond Fitness Barre Training, and for pilates by Equinox Institute. When not training for a marathon, hanging with her dog Remy, or teaching classes here and around Boston, she works full time at a Boston Financial Firm. 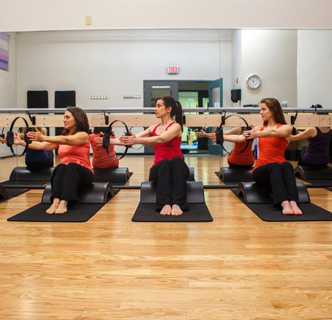 BETSY MCLAUGHLIN is one of our best and most innovative Pilates & Barre instructors. Betsy is constantly on the hunt for new and more challenging exercises, so you'll always do something you haven't done before in her classes. Betsy's favorite workout is Advanced Pilates Mat, and she loves challenging people to do more advanced exercises than they think they can do. She is welcoming and encouraging to new people, a stickler for proper form, and loveably irreverent. We tell people you need a strong core to withstand her Reformer class workouts and a strong stomach (for some of the conversations that go on in there)! 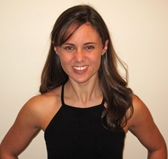 Betsy teaches pilates group classes and privates full time, and joined our team in 2006. She has attended many of our workshops including Pre & Post Natal Pilates, Pilates & Barre for Injuries, TRX/ BOSU & Tower Programming. Betsy is also fully ensconced in STOTT PILATES, and takes their weekly instructor choreography classes as well as all their advanced instructor workshops, including Pilates for cancer survivors. KRISTIN NICKSON is a Beyond Fitness Barre Class enthusiast turned instructor! She took classes regularly here (mostly Monica's famous Saturday Barre class and Caryn's classes) for 2 years before diving into our Anatomy in Clay Workshop and our Intensive Barre Teacher Training. So her classes have a similar high intensity, with focus on safety. If you are looking for a challenge, she's got you covered! Since she's joined the Beyond Fitness Pilates Studio team, she's taken all our instructor workshops including Injury and Special Populations, pre and post natal pilates and barre, and BOSU and Barrels training. When not teaching or working her "real job" as a pharmacist, Kristen is a busy mom of two daughters. 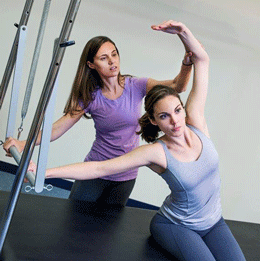 We offer Intensive Barre Certification, Pilates Anatomy & Mentoring.